1964: Lettered, scholastically ineligible 2nd semester. Lucky for KU, Wesley committed to the Jayhawks. After leading the freshman squad in scoring in 1963, things were looking up for the Jayhawks in his sophomore season. Expectations were high, as he was teaming up with George Unseld, the team’s leading scorer and rebounder the year before, and senior star Al Correll. The year turned ugly, however, when coach Harp was hung in effigy mid-season, Wesley was declared ineligible for the second semester and Correll finished his career eligibility in December, and the team finished 13-12. Harp was fired at the end of the season and assistant Ted Owens was promoted to head coach. 6’11 Wesley came on strong in the following season, though, leading the team in scoring (23.5 per game) and rebounding (8.8 per game). Coach Owens said, “He was an enormous worker who grew and grew. At K-State his sophomore year, he scored 28. His junior year he had the big game against Loyola (42 points, eighth-best mark in KU history). 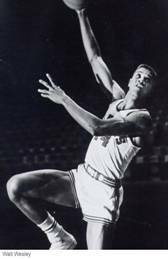 He played against St. John’s and scored 38 in Manhattan, and the New York papers called him the ‘New Wilt’.” The Jayhawks finished second in the conference, won the conference tourney, and finished 17-8. Walt was named All-American. For the year, Walt scored 20.7 points and grabbed 9.3 rebounds per game, and was again named All- Big 8 and All-American. He finished his KU career with 1,315 points (19.3 average) and 565 rebounds (8.3). 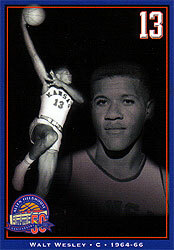 He was a first round pick of the old Cincinnati Royals and spent ten years playing for eight teams in the NBA. He finished his career with 4,998 points and then returned to KU where he became an assistant under Ted Owens for one season. After getting his degree in education, Wesley coached as an assistant at Western Michigan and then at the US Military Academy in West Point, before coming home for good in 1995, to operate several programs for the Ft. Myers Parks and Recreation Department, and then began his work as Executive Director of the Police Athletic League, an athletic and educational program for at-risk children. 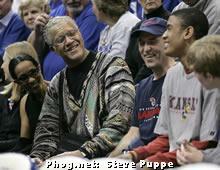 KU honored Wesley by retiring his #13 jersey in December, 2004. “Without a doubt, it’s one of my greatest thrills. It’s quite an honor, especially at the University of Kansas, to have your jersey hung in the rafters”, Walt said that night. Walt Wesley, KU grad of the Class of '79, was known for his ability to put points on the scoreboard. He finished his three-season collegiate basketball career at KU with two-time All-American honors, a KU no. 10-ranked career points-per-game average and a spot in the rafters of Phog Allen Field House. After 10 years in the NBA, Wesley now serves as executive director of the Police Athletic League in Fort Myers, Fla.